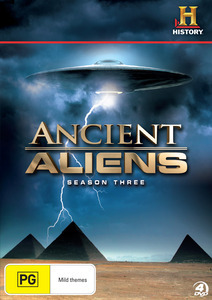 Ancient Aliens Season 3 DVD Review Informative and whacky! The third season of the popular History Channel series returns on DVD and features 16 episodes of this very interesting TV series that poses the question to the viewer that aliens may have had a hand in dictating the direction of mankind. Linking the supernatural to history, Ancient Aliens uses re-enactments, visits to important historical places around the world and interviews to shape the 16 episodes on this release. As expected, not all the episodes are totally interesting but for the majority, they will draw you into their rather interesting theories which once again opens the question, have aliens beings influenced human history on Earth? What I did enjoy about Ancient Aliens Season 3 was how it linked the unexplained to legend and facts plus some of Hollywood's biggest block buster movies like Cowboys vs Aliens and even Prometheus. Just be warned that not everything is scientific in this series and when I heard that Vampires and Zombies may have come from space, I did raise an eyebrow in amusement. Nonetheless, it is an entertaining series, especially if you're a fan of sci-fi and history as it melds these two fields quite well. My favourite episode however was Aliens, Gods and Heroes which links the mythical gods of yesteryear to that of aliens. It also asks how did mankind come up with these wondrous deities and were these gods and goddeses actual aliens themselves that had almost superhuman abilities? Interesting to say the least. Episode 6 is another enjoyable episode which actually links back to the movie Prometheus and the "engineers". The theory behind this episode is that mankind were influenced by an alien race dubbed engineers which allowed ancient man the abilities to build wondrous temples and cities. Where we visited by aliens thousand of years ago? Possibly... and by watching this episode, it definitely raises more questions than answers. However alien beings and UFO's are still integrated into our culture and even today, people are still witnessing unidentified flying objects around the globe with some sightings being in places of historical significance. True or false? You be the judge but Ancient Aliens Season 3 is also about entertainment plus information and thankfully it delivers both, even though some of it is a little whacky.